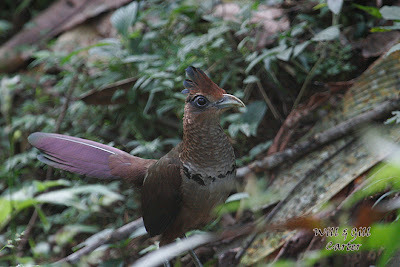 My wife, Gill and I encountered this Rufous-vented Ground-Cuckoo at 8:15 on the morning of Jan 06 approx. 1 km in from the front gate on Pipieline Road. Probably the same individual that Panamanian guide Guido Berguido saw the day before. The antswarm paralleled the road for about 30 minutes and then began to cross. We then were treated to unobstructed views of this beautiful bird for nearly 3 hours. 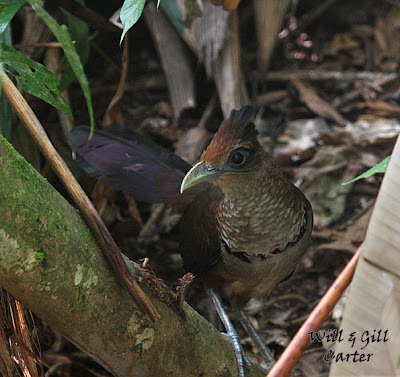 During a lull in activity, the bird roosted on a log and was motionless for 10 minutes or so. Traffic was kind enough to pause at our request and at times there were 15 spectators watching the swarm activity. 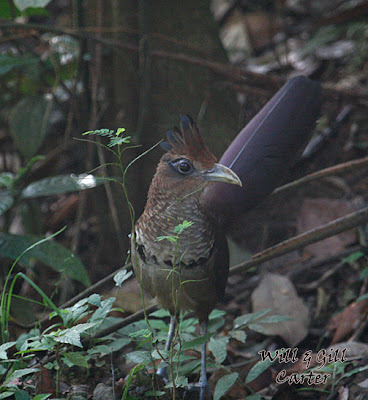 Later, inside the forest, we watched the swarm and a Rufous Motmot was competing with the Ground-Cuckoo for insects—3 times the two birds collided as they dashed for insects—the Ground-Cuckoo seemed to come away with the food each time.